1955- The reserve was earlier being established as the Sawai Madhopur Gaming Sanctuary by the Government of India. 1973- Later it was declared as one of the Project Tiger Reserves in India. 1980- Ranthambore became a national park. 1984- The adjacent forests were declared as Sawai Mansingh Sanctuary and Keladevi Sanctuary. 1991- The tiger reserve was enlarged to include Sawai Mansingh and Kaladevi Sanctuaries. The Ranthambore National Park is best known for the tiger population and is one of the perfect destinations in India to witness the majestic predators in the jungle living naturally. It is the only reserve in the region where the tigers can be easily witnessed at any point of time. This is the reason why the region is superbly famous for the tiger tours. Apart from tigers, the major wild animals include leopard, nilgai, wild boar, sambar, hyena, sloth bear and chital. It is also home to wide variety of trees, plants, birds and reptiles. The reserve also has the thriving bird population of with more than 270 different species of birds. 2005 was the year when the tiger count was 26; significantly lower than the recorded tiger population of the reserve in 1982, which then were 44. 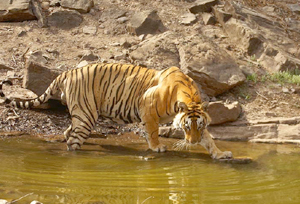 The non-government resources revealed through a survey that in the year 2008, 34 adult tigers in Ranthambore were recorded. Also more than 14 tiger cubs were also been recorded that brings huge accolades to the conservation efforts and the wildlife management authority for the well-beings of the Ranthambore Tigers. 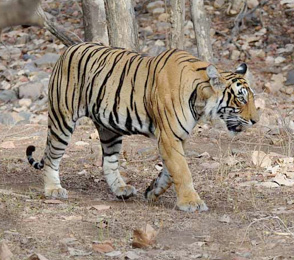 More significantly, tigers in Ranthambore are today's heroes since they are being known by their very own name and have their own identity with their unique notable marks. With the emotional interactions of the wildlife experts, photographers and jungle officials, Ranthambore tigers are world famous with their local pet names including the most famous tigers like Machali (T-16), Dollar (T-25), Sitara (T-28), Bina One, Bina Two and many more like them. Quite appraisingly, with such increase in the counts of the tigers in Ranthambore, some of the tigers have been relocated to the nearby reserves like Sariska Tiger Reserve. A recent relocation of the tigress sisters (Bina One and Bina Two) is the latest example of it. The park is the dry deciduous forest type that makes the tiger sighting more common. The dry deciduous forests were once a part of the magnificent jungles of the Central India. The Ranthambore Park is being located at the edge of a plateau and is bounded to the North by the Banas River and to the south by the Chambal River. The park is also being satiated with the historic Ranthambore fortress where several lakes can also be found. Ranthambore is also the site for one of the largest banyan trees in India. Ranthambore Fort - this is the most ancient fort in the Sawai Madhopur area located just 13 Kms from Sawai Madhopur Railway station to bring a magnanimous charm for the wildlife as well as for the heritage lovers. Founded in 944 and initially named as "Ranath Bhawar Garh" which means "a place of Rajput warriors", the Ranthambore Fort is today an ideal territory or the ideal ruling area for the most famous Ranthambore tigress- the Machali. The tiger lovers, especially the fan of Machali who is better known as the "Queen of Ranthambore" specially come to this fort to catch the mightiest and the royal moves of the pride of Ranthambore- the Machali, who is best known for her bravery acts and winning over the other residents of Ranthambore to capture the territory. Bakula Region - Ranthambore wildlife sanctuary is the ultimate region which is mostly covered with thick forests. 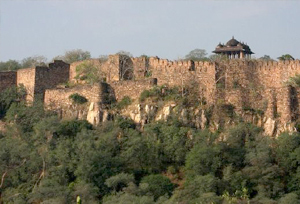 Bakula is among such thickly forested regions in Ranthambore to carry the most wildering effect on the region. Bakula region is plush with various pools and water-holes including the dense forest part. The dense forest cover and easily availability of water is the ultimate reason for the presence of abundance of wildlife in the Bakula Region. This is the reason why tourists can easily trace many tigresses with their young cubs near the water holes. Bakula dense forest is an excellent place for tigresses and their young cubs to make a great stay and relax. Kachida Valley - The Kachida Valley is located at the outskirts of the reserve to bear different outcrops and low hills. The tourists can make a good excursion through Jeep Safari to explore the region of the Kachida Valley. This is the only location where Panther population of Ranthambore National Park is found, as they avoid venturing in the main area of jungle so they would not indulge into any kind of conflicts with tigers. Besides, beers are also found in a good number here. Lakarda Anantpura - Located in the north and north-west part of the Ranthambore National Park, the Lakarda Anantpura is an area ideally located to visit great amount of Sloth Bears. Tourists can also find lots of ant hills, the favorite recipe for the beers. Although, it is a rare chance to visit these beer as they kept themselves hidden in the lush region, but Hyenas and their pugmark can be easily seen over here. Jogi Mahal - the Jogi Mahal is actually a fort which is recognized among the must watch places in the famous Ranthambore national park. Locating quite near to the Ranthambore Park, this fort brings amazing facilities to the tourists making their journey more comfortable. 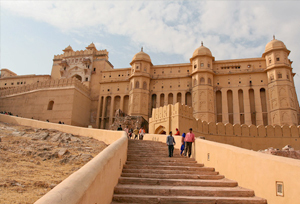 Jaipur - the most popular touring spot for most of the national and international tourists, Jaipur, the capital city of Rajasthan attracts tremendous people for its magnanimous architectural splendors like City Palace, Jal Mahal, Hawa Mahal, Amber Fort, Nahargarh Fort and more. Acutely at 180 kms by road from Ranthambore, Jaipur is the perfect land for you to make a great excursion for a change. The tourists can also explore colorful cultures and traditions to get closer to the incredible India. Agra - the land of Taj Mahal has attracted probably most of the tourists worldwide to find the world's one of the wonders. For any reasons of India tour, a Taj Mahal trip is a must for all since it is the perfect exemplar spot of Mughal architecture of the then era. The symbol of love is 247 kms away from Ranthambore Reserve, so if anybody really wishes to find some romantic longings with her/his companion after a hectic excursion amidst the tigers, Agra is the best answer for them. Bharatpur - yet another charming place for the wildlife lovers and for those who understand the meaning of a complete wildlife tour in India, Bharatpur is the land of the birds to explore around 400-600 different species of birds. Perfectly called a paradise for the ornithologists, the Bharatpur Bird Sanctuary is 237 kms away from the tigers' world at Ranthambore to find the great migratory counts of avians during winters and the perfect land to visit the famous Siberian Crane in the area is a must place for more wildlife knowledge and pleasure. 2 1st November to 31st January 7.00 A.M. to 10.30 A.M 2.00 P.M. to 5.30 P.M.
3 1st February to 31st March 6.30 A.M. to 10.30 A.M 2.30 P.M. to 6.00 P.M.
4 1st April to 15th May 6.00 A.M. to 9.30 A.M 3.00 P.M. to 6.30 P.M.
For a perfect reason and season of November to March the tourist/ tiger lovers can make their tiger trip in Ranthambore more successful and is closed during monsoon in the months of July to August. By Air : Jaipur being the nearest airport to reach Ranthambore is simply at 180 kms of distance from the reserve area. By Rail : Ranthambore National Park is around 11 km away from Sawai Madhopur railway station that lies on the Delhi to Mumbai trunk route. By Road : Ranthambore is the area which is directly connected to many road links with a good network of buses to reach at Sawai Madhopur. Though the frequency of bus services is not great but and is best advisable to hire a car or taxi to reach at Sawai Madhopur. The Kota-Ranthambore mega highway is simply 1.5 kms away from the location. 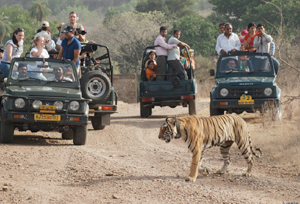 For a perfect tiger tour in Ranthambore, some relaxing amount of time to devote is really needed. As it is not a matter of one day to explore all the tigers in the area. This is the reason; the tourists should make some comfy arrangements for accommodation at Ranthambore hotels and resorts. Depending upon their days to be spent here and the demand of their comforts, the area is skill fully being casted with great accommodative options. Although government lodges are available in the region but for a luxurious and urban stay amidst the natural environment there are other beautiful options of hotels and resorts in Ranthambore.